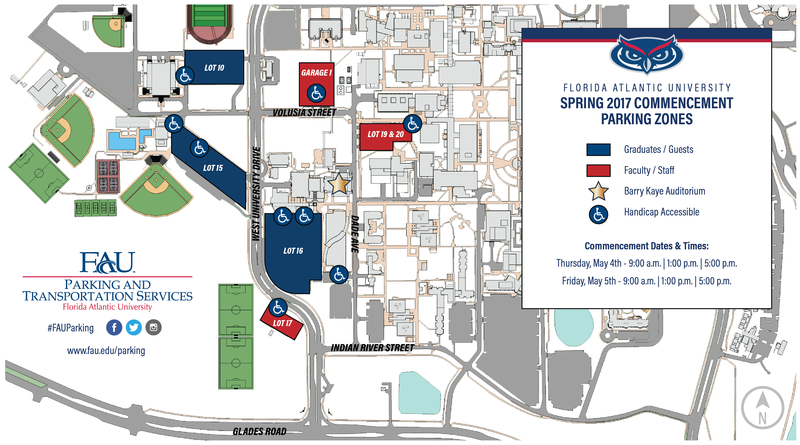 FAU Parking and Transportation would like to advise those on the Boca Raton campus that there will be an increase in traffic on Friday, March 22 and Friday, March 29, 2019, along West University Drive in the areas of Lots 15, 16 and Parking Garage One. We are expecting the height of activity to be between 8 am and 10 am in these areas due to Choose FAU Days. For those who would like to avoid possible congestion, we would encourage you to travel and park off of East University Drive in Lots 1, 2 and Parking Garage 2. 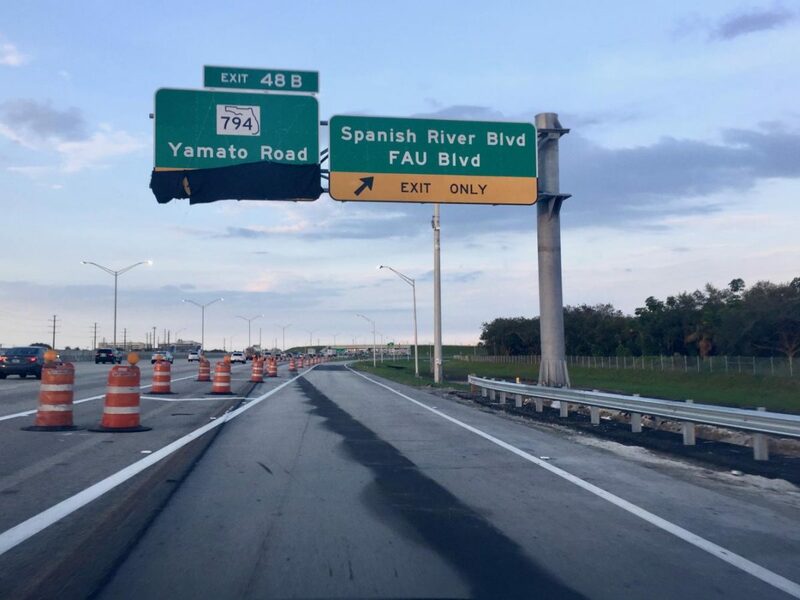 Drivers can now exit both directions of I-95 at Spanish River Boulevard. 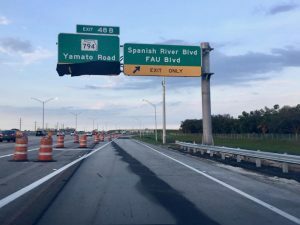 The new exit gives FAU students and other commuters an alternative to sitting in traffic at the Glades Road exit that routinely backed up onto I-95. Less traffic? Yay! Construction is taking place today at the crosswalk in front of Garage 3. Expect delays to the flow of traffic. Thank you for your patience. The Spring 2017 Commencement Ceremonies will be held on Thursday, May 4th and Friday, May 5th, 2017 in the Carole and Barry Kaye Performing Arts Auditorium on the Boca Raton Campus. The commencement times are scheduled for 9:00 a.m., 1:00 p.m., and 5:00 p.m. on both Thursday and Friday. Traffic will be especially heavy on both days of graduation, particularly at the Glades Road entrance along West University Drive. 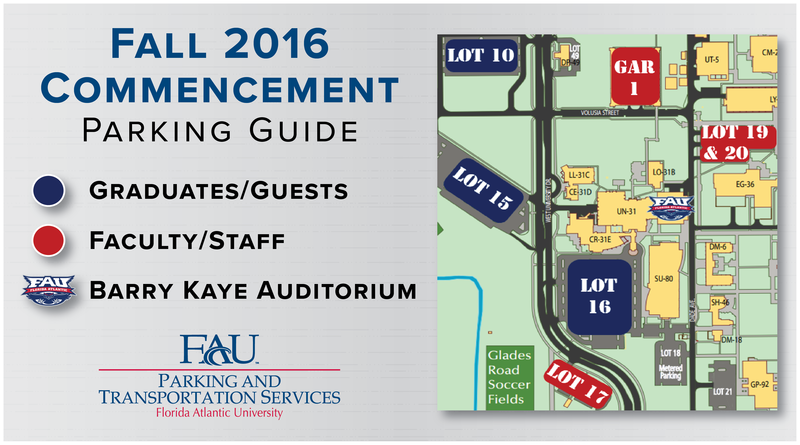 Parking Lot 16, located directly in front of the Student Union, will be reserved for disabled and VIP access for ceremony attendees only. Please note that on graduation day, Lot 16 will be considered a reserved lot and not available for use by permit holders and will instead be designated for graduates and guests only. 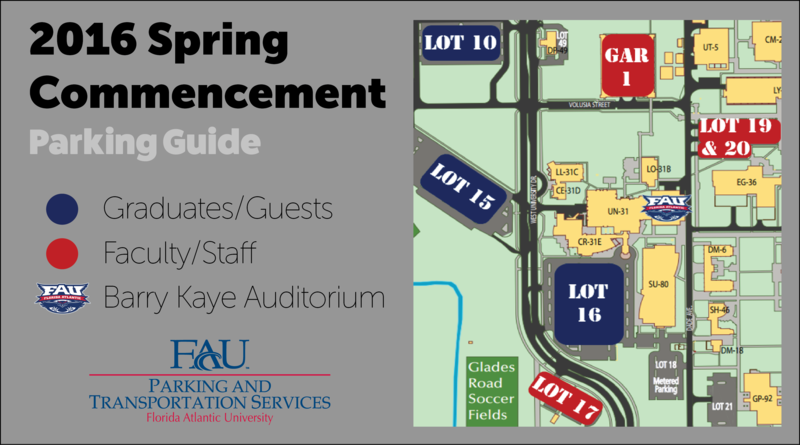 Parking and Transportation Services and the FAU Police Department are requesting that all staff, faculty and students who work in Buildings Student Support Services (80), Student Union buildings (31 and 31A-E), and Housing (46) park in Lots 17, 19, 20 or Parking Garage One on Volusia Street. Employees working in buildings 80, 46 and 31 with valid disabled placards will be able to park in Lot 16. Please access the parking lot using the south-east entrance off of Dade Avenue. When approaching the parking lot, please have your disabled parking permit visible for verification upon entry to the lot. Thank you for your cooperation as we work together to make this Graduation Day a day for the graduates and their guests to enjoy and remember. If you have any questions, please contact our office at (561) 297-2771. For graduation info, visit: https://www.fau.edu/registrar/graduation/ceremony.php. Due to an event expected to take place on Saturday, January 28th, lot 14 will be closing on Friday, January 27th. 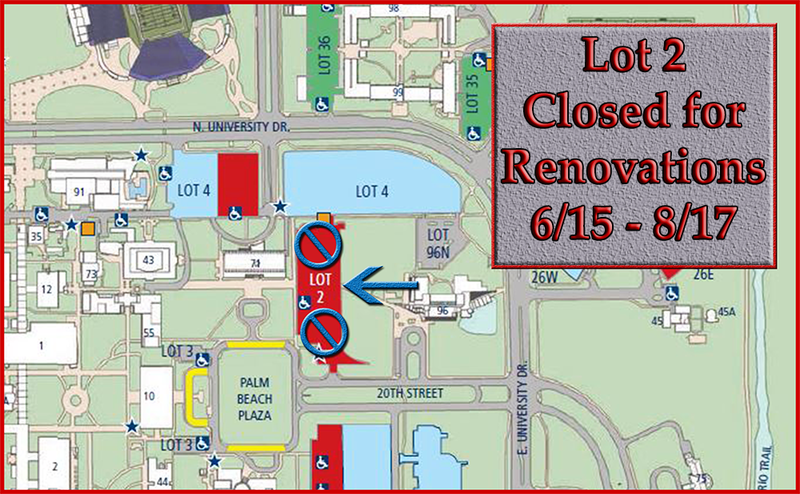 All vehicles in lot 14 need to be removed by Friday evening, no later than 5:00 pm. Any vehicles still in the lot after 5:00 pm are subject to towing at the owner’s expense. Thank you for your cooperation. The University will mark the end of the Fall 2016 Semester with commencement ceremonies on Thursday, December 15th and Friday, December 16th. The commencement ceremonies will be held in the Carole and Barry Kaye Performing Arts Auditorium on the Boca Raton Campus at 9:00 am, 1:00 pm and 5:00 pm on Thursday and 9:00 am and 1:00 pm on Friday. As part of the ongoing construction taking place on Spanish River Boulevard and the surrounding area, there will be a closure taking place on FAU Boulevard and Spanish River Boulevard from Friday, December 9th to Monday, December 12th between 9:00 pm and 5:00 am. 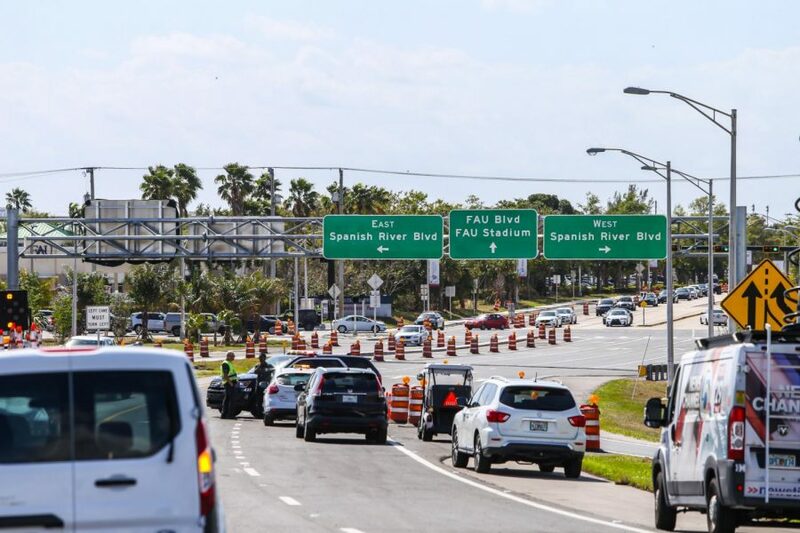 As a result of this construction, we encourage you to use the NW 20th Street or 13th Street/Glades Road entrances during the anticipated construction times. We apologize for any inconvenience this may cause. For more information on the I-95/Spanish River Boulvard Interchange construction project, visit www.d4fdot.com/pbfdot/PBC-I95_I-95_Interchange_SpanishRiverBlvd.asp. 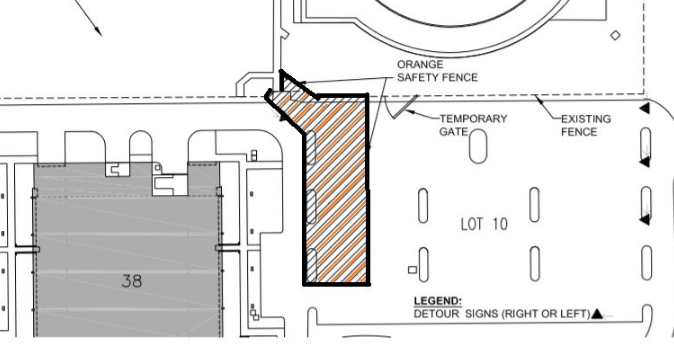 There will be construction taking place in the northwest section of lot 10 from October 15th to October 29th causing a temporary detour around the Burrow and Track & Field. The University will mark the end of the 2016 Summer Semester with commencement ceremony on August 9th. The commencement ceremony will be held in the Carole and Barry Kaye Performing Arts Auditorium on the Boca Raton Campus. 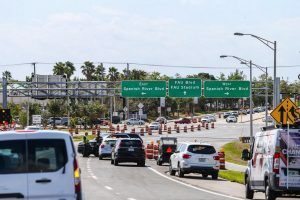 Traffic will be especially heavy on that day of graduation, particularly at the Glades Road entrance along West University Drive. Parking Lot 16, located directly in front of the Student Union, will be reserved for disabled and VIP access for ceremony attendees only. 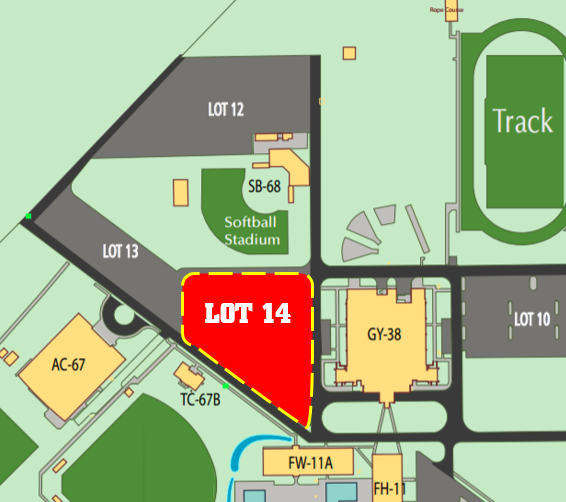 Please note that on graduation day, Lot 16 will be considered a reserved lot and not available for use by permit holders and will instead be designated for graduates and guests only. Parking Garage 2 will be temporarily closed from Monday, July 25th to Friday, July 29th for lighting renovations. 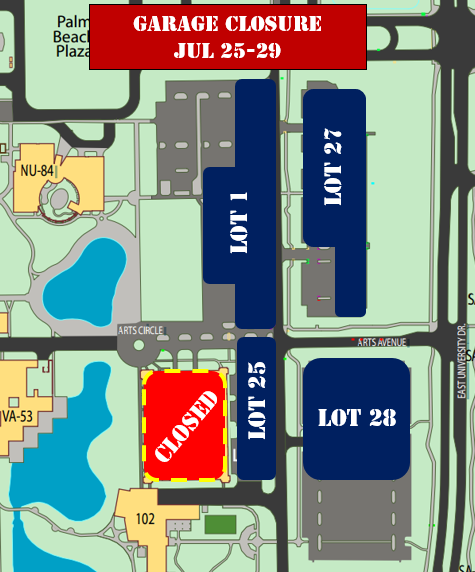 Parking will still be available in the following lots: Lot 1, Lot 25, Lot 27, Lot 28. The University will mark the end of the 2016 Spring Semester with commencement ceremonies on Thursday, May 5th and Friday, May 6th. The commencement ceremonies will be held in the Carole and Barry Kaye Performing Arts Auditorium on the Boca Raton Campus at 9:00 am, 1:00 pm and 5:00 pm on both days. UPDATE: In addition to the traffic closure on the westbound lane of North University Drive, the southbound lane of FAU Boulevard between PBSC Drive and North University Drive will be closed as well. Traffic going south on FAU Boulevard will need to divert to PBSC Drive. Traffic attempting to go north towards Spanish River Boulevard will only be able to travel through NW 8th Avenue. This closure is only expected to take place on Monday, May 9th. 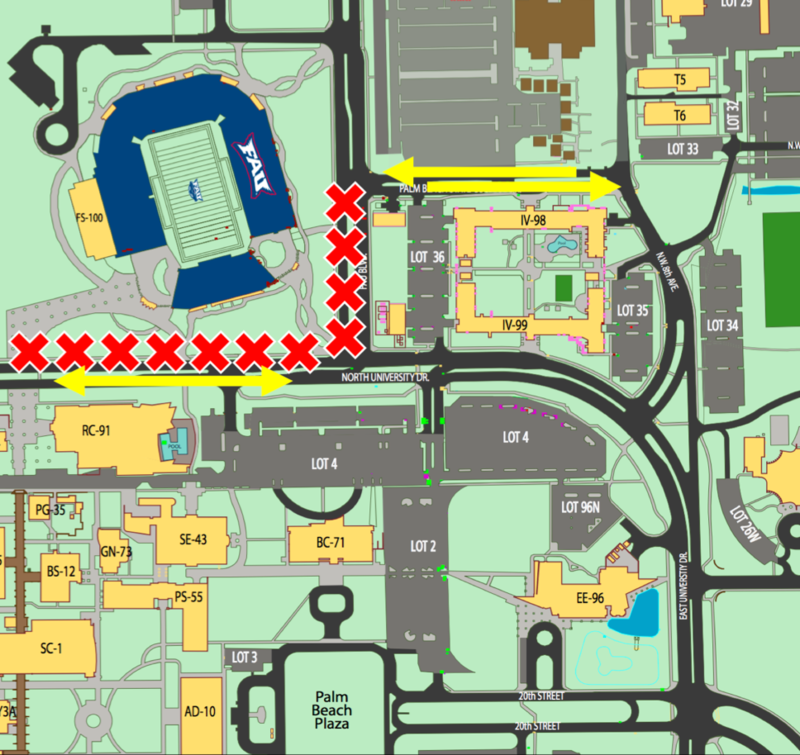 Weather permitting, traffic will be interrupted on Monday May 9th and Tuesday May 10th for construction that will be conducted on the northwest corner of FAU Boulevard and North University Drive. The westbound lane of North University Drive will be completed closed. All traffic going east and west will be re-routed to the eastbound lane of traffic. The construction will take place between approximately 8:00 am and 4:00 pm on Monday and 9:00 am and 5:30 pm on Tuesday. Expect minor delays. Thank you for your patience. FAU will be closing at 1:00 p.m. on September 11, 2015. 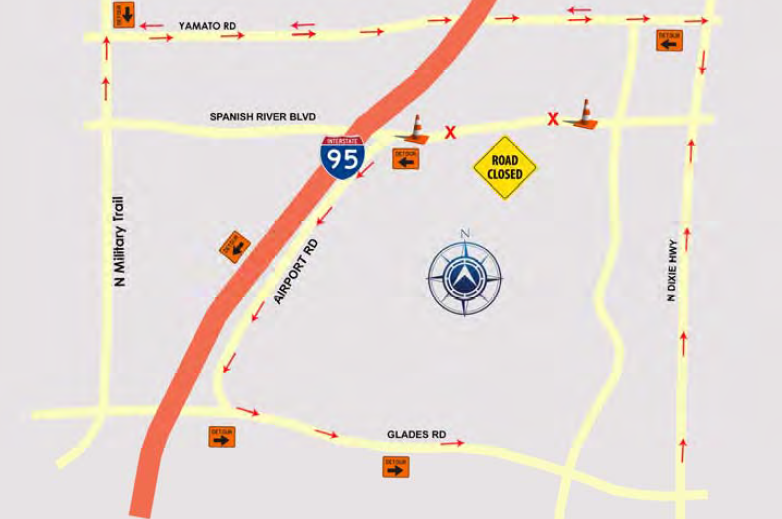 This closure is expected to generate significant traffic in a short period of time. Normally the university empties over a period of time rather than all at once. 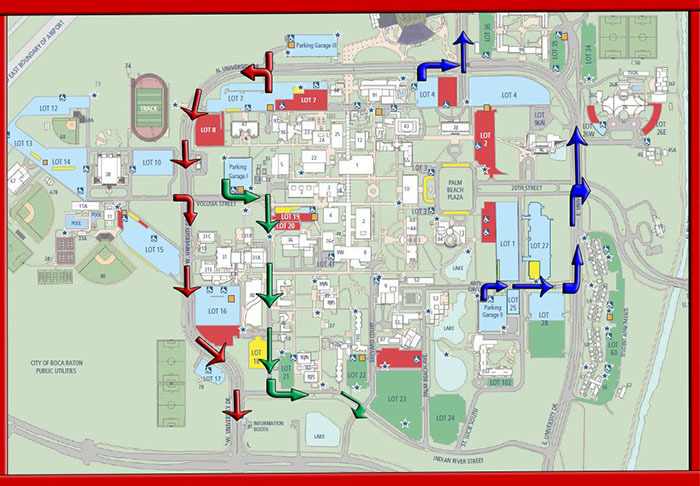 To ensure an orderly flow of traffic and to prevent significant delays, we will direct traffic to the nearest exit to campus. This will help traffic flow by reducing cross traffic. We ask that you cooperate with personnel directing traffic and follow their directions as you may be required to utilize a different exit than normal. We also ask for your patience as it will take time to get all traffic off campus. Those in the garages should remember there is restricted traffic flow and it will take more time than usual to exit. 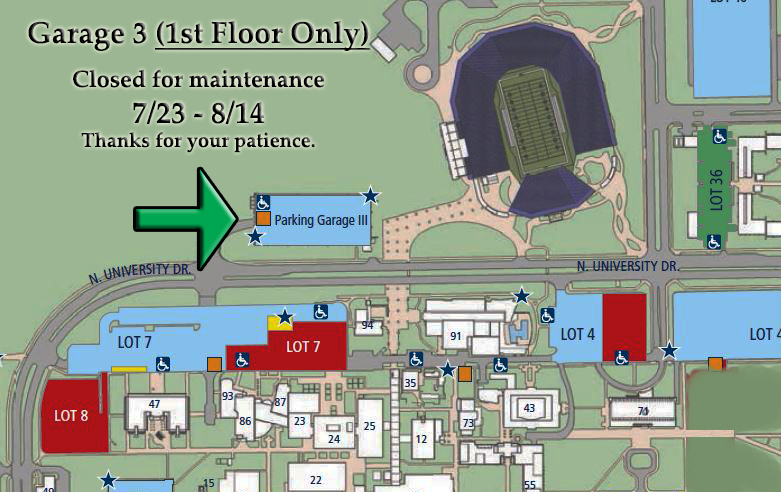 The 1st floor of Garage 3 will close for maintenance Thursday July 23rd – August 14th, 2015. The maintenance will only affect the FIRST floor. The rest of the garage will be open for use. As always, we thank you for your patience.